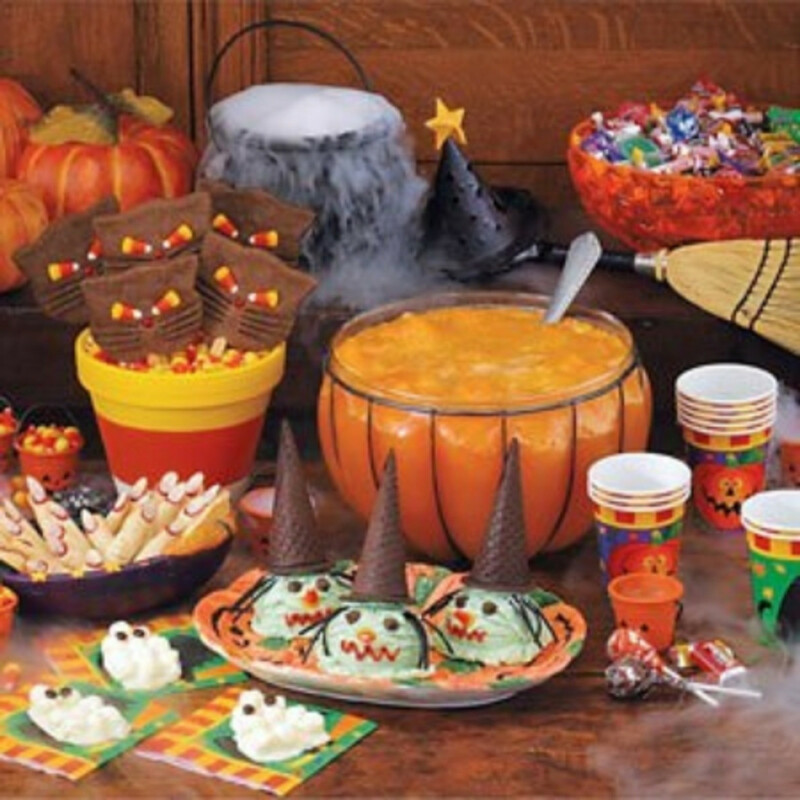 Host a creeptastic party filled with ghoulishy tasty snacks for all your little goblins. 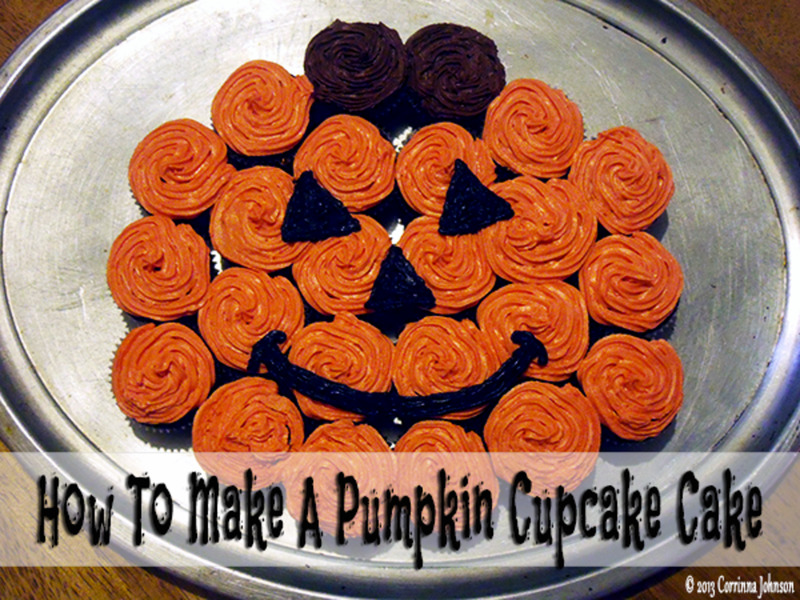 Make adorable treats that are perfect for any Halloween party. From healthy apples to not-so-healthy cupcakes, here are some great ideas to cover a range of tastes. 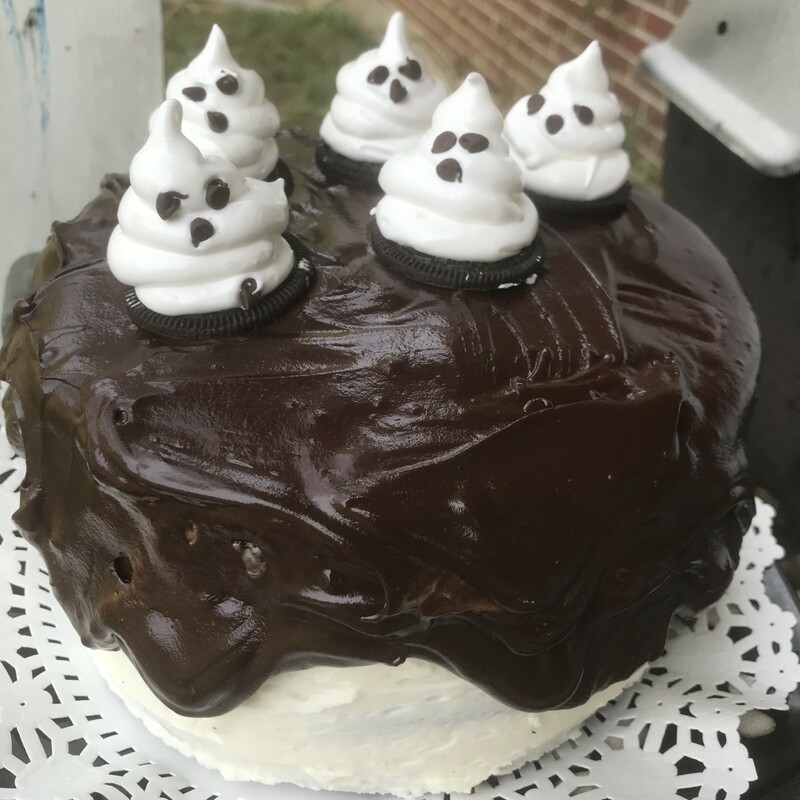 Mummify your cakes and brain your jelly to get those guests quaking in their boots! 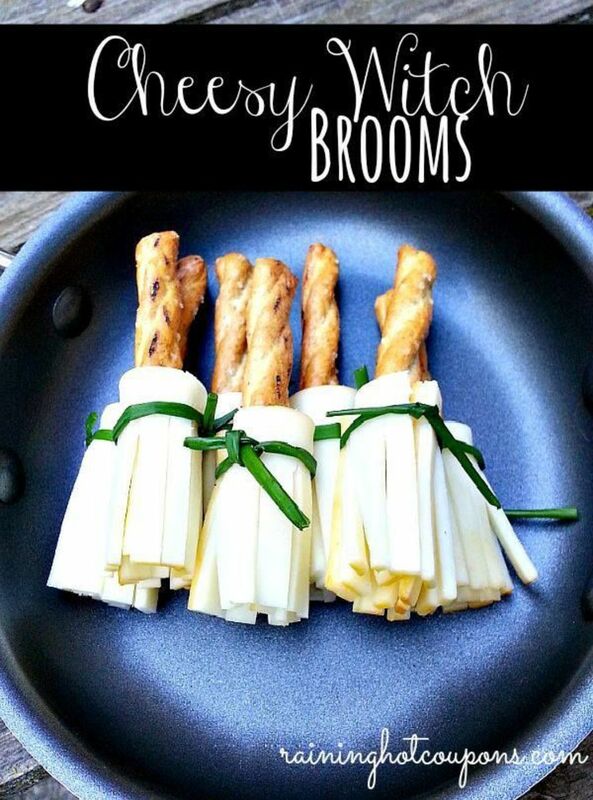 Cheesy Witch Brooms are fun and easy to make with pretzels and cheese. 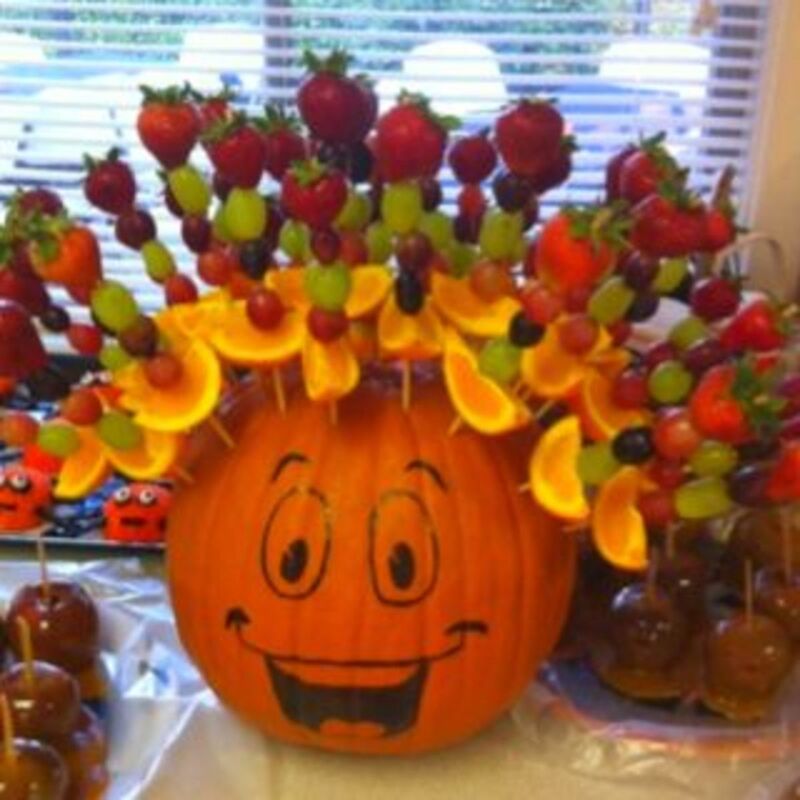 Kids will go crazy for them and they will look great on your party table. 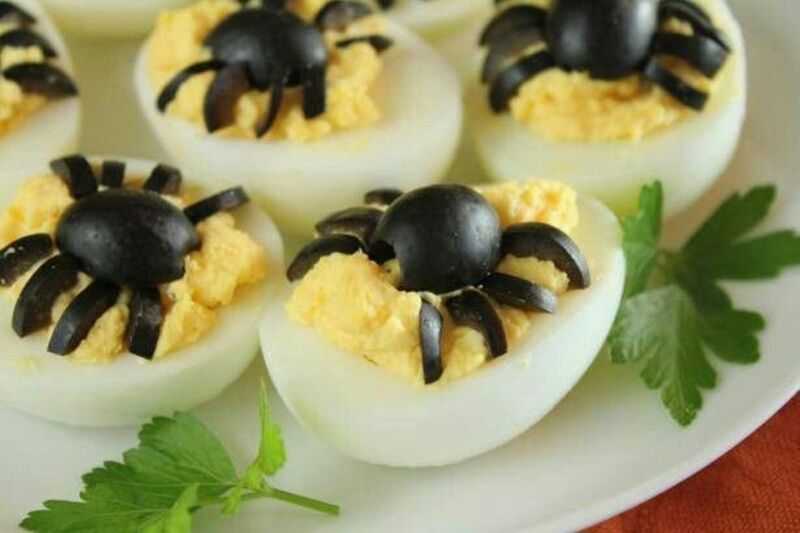 Cut pitted black olives in half lengthwise and nestles one half on top of an egg for the body, and then cut the other half crosswise into thin slices to form the creepy legs. 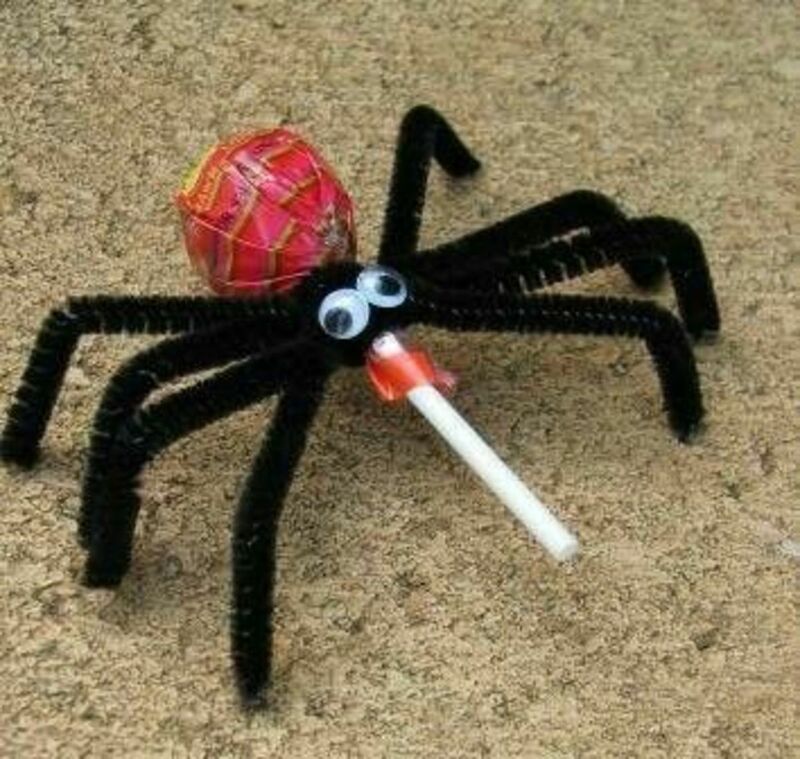 Buy a pack of lollipops and get some pipe cleaners and googly eyes and make some creepy, crawly spiders! These are low cost and cute! 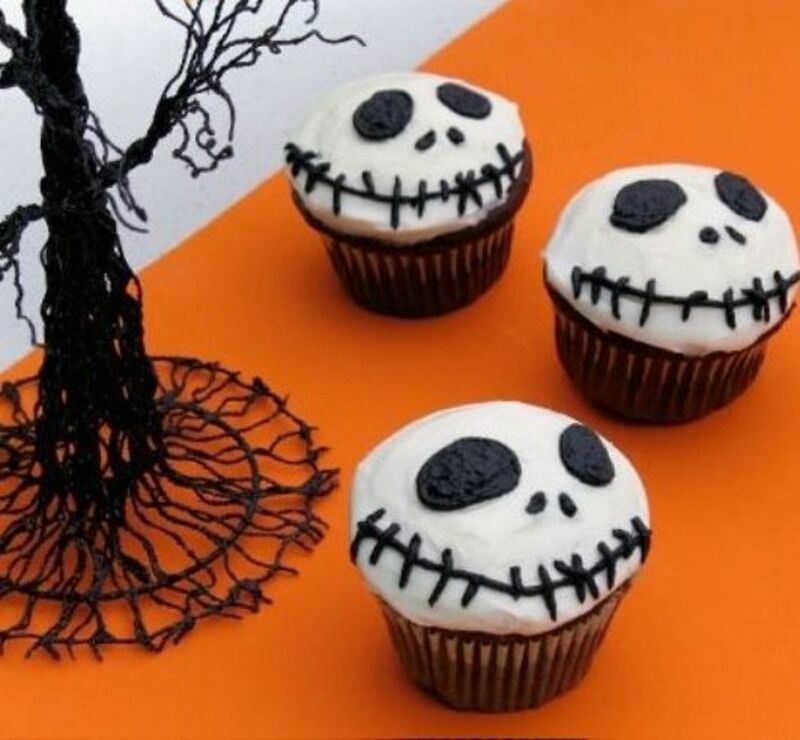 Oh, and the best part: when Halloween is over, you can eat them! 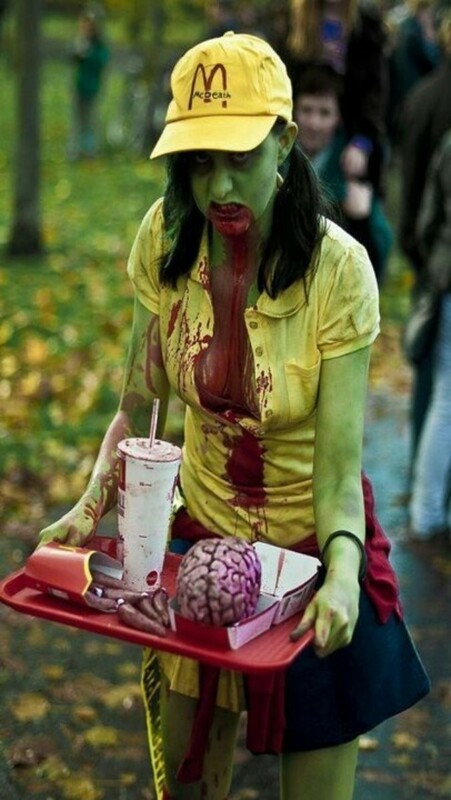 Every zombie loves brains ! 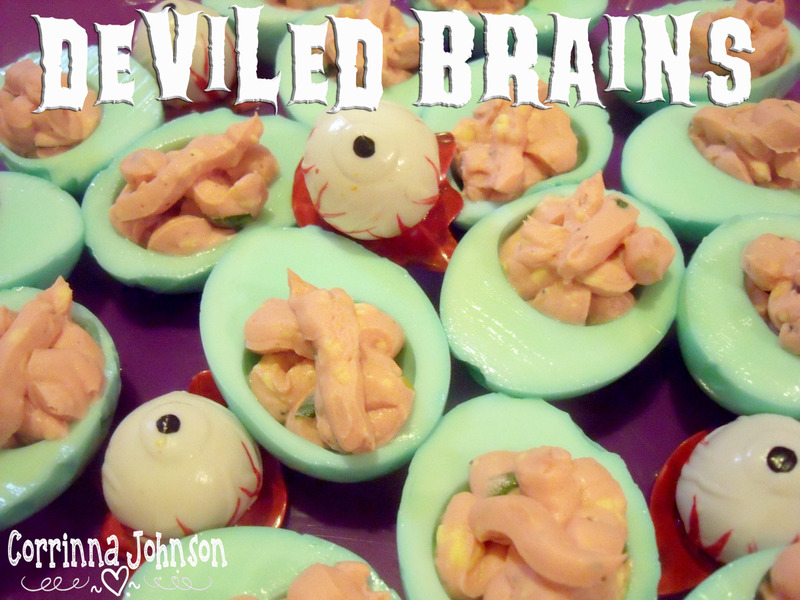 Buy brain shaped jelly molds to make your brains extra tasty. 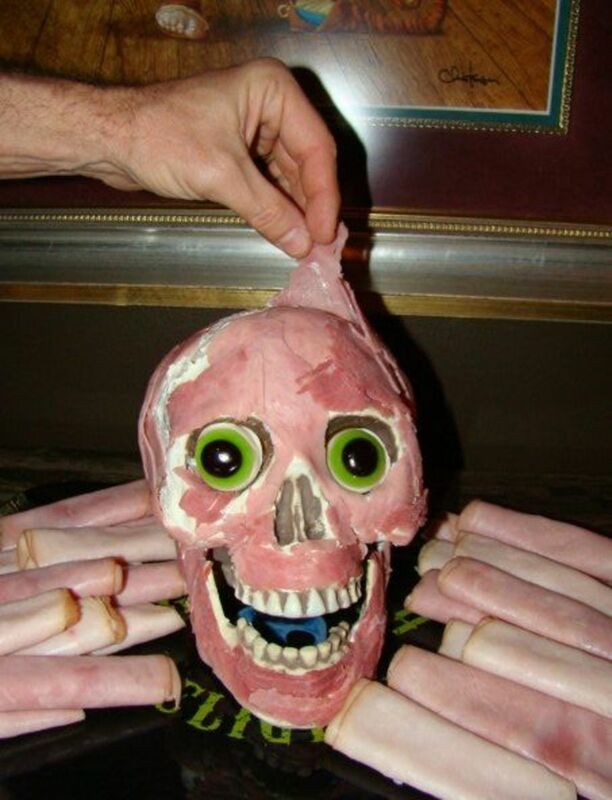 Make ham into a creepy meat head to serve at lunch or snack time on Halloween. 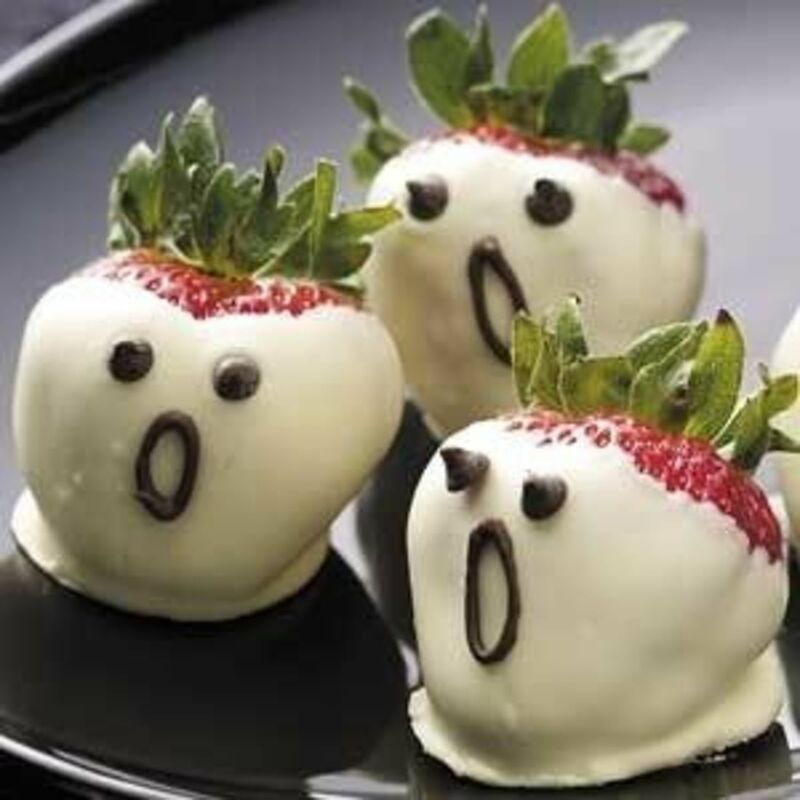 For a spooktacular treat, dip strawberries in white chocolate and add milk chocolate for eyes and mouth. 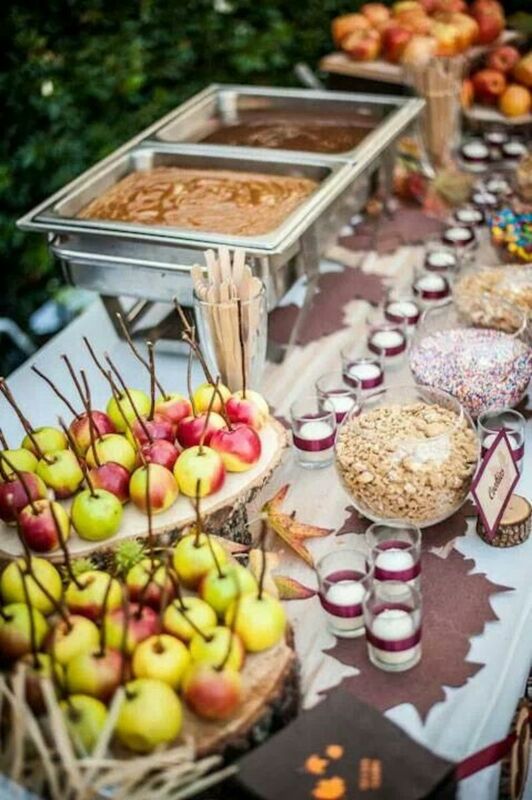 Great for a Halloween party, lay a table with all the trimmings for making candy apples. 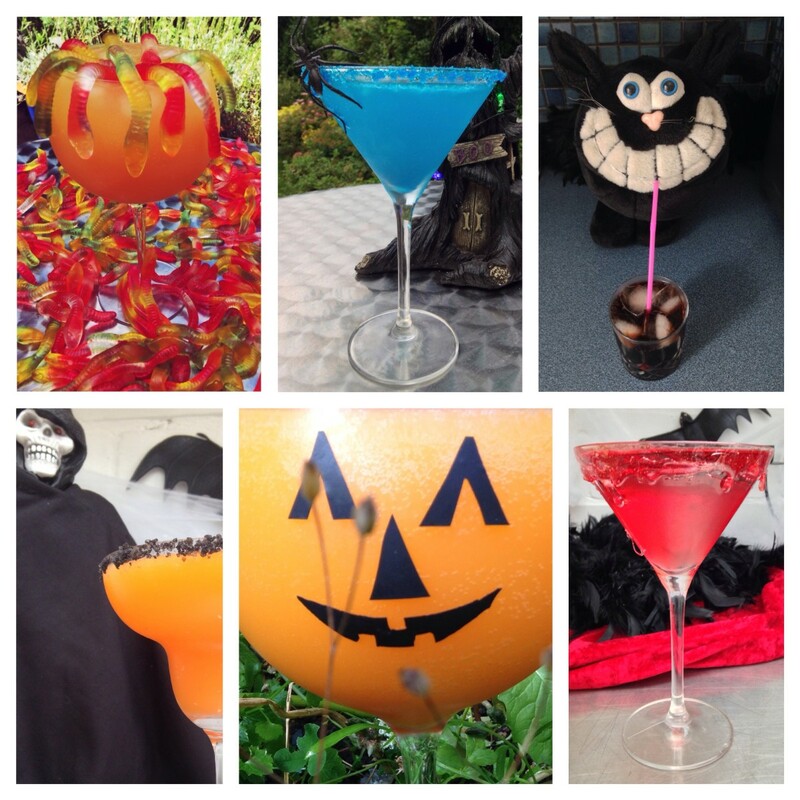 Remember to check the link for more awesome ideas! Great to serve kids for their lunch, use olives for eyes and slices of mozzarella strategically placed to form 'bandages'. 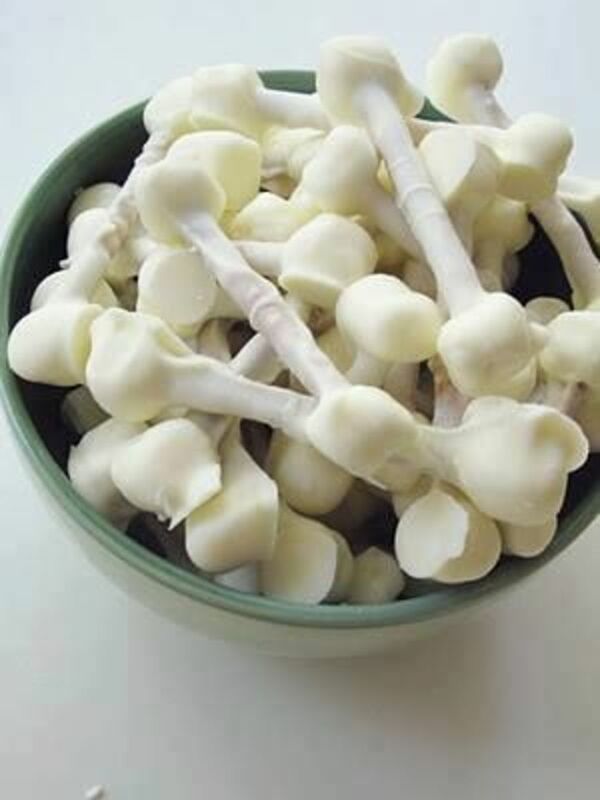 Marshmallows on each end of a pretzel, dipped in white chocolate = bones! 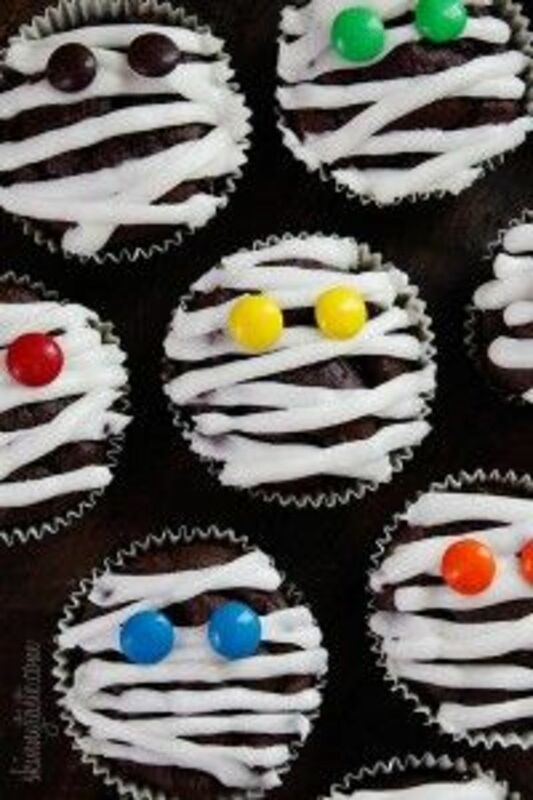 You'll need to make a batch of chocolate cupcakes for these and add white frosting to create the mummy look. Use M&M’s as the eyes. 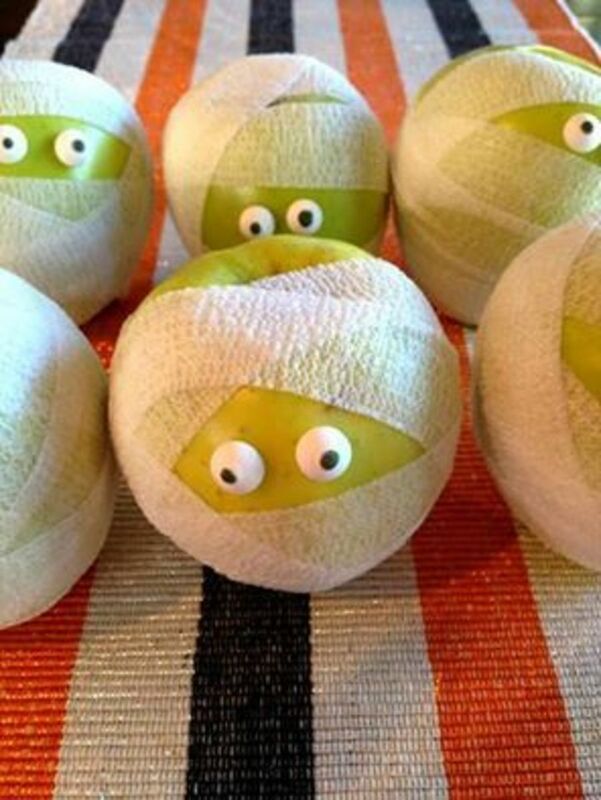 This is so simple and fun to do with the kids, simply wrap gauze tape around apples and add candy eyes. Get more fun ideas by clicking the link at the top of the page. 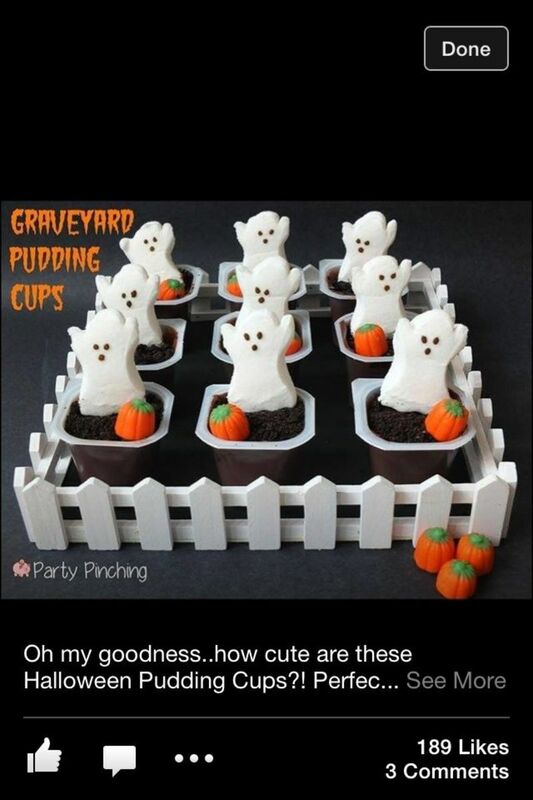 Add Peeps ghosts to puddings. Use the Sunrise brand harvest mix/candy corn for the pumpkins and add to pudding pots. Crumble an oreo for the 'dirt'. 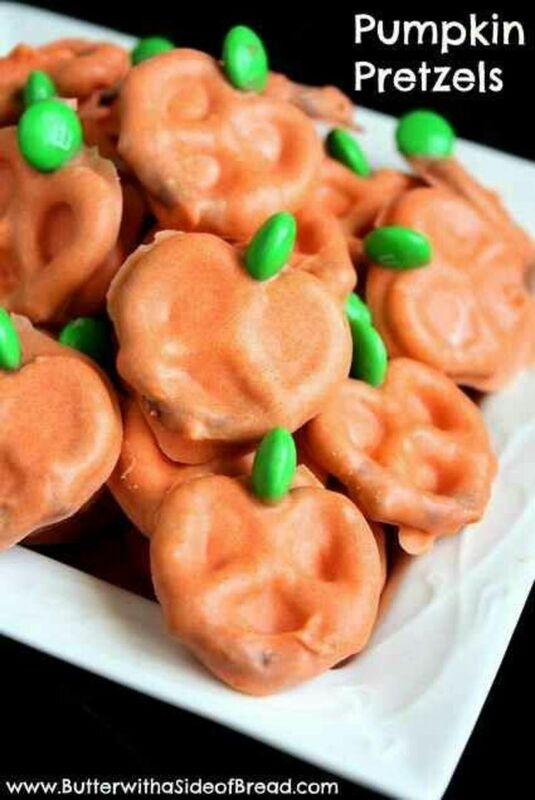 The kids can help to make these fun Pumpkin pretzels--use white choc. 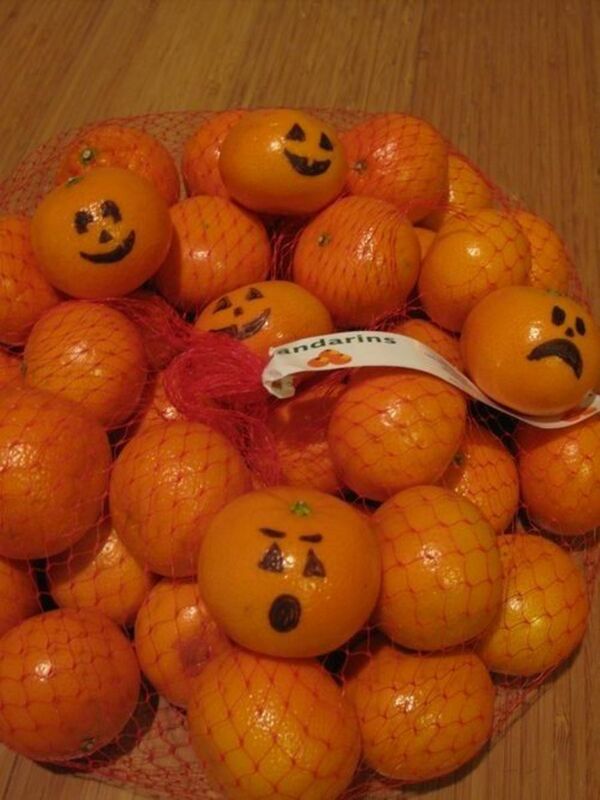 chips with orange food coloring and green M and Ms.
Avoid candy and draw jack-o-lantern faces on mandarin oranges for a school party. 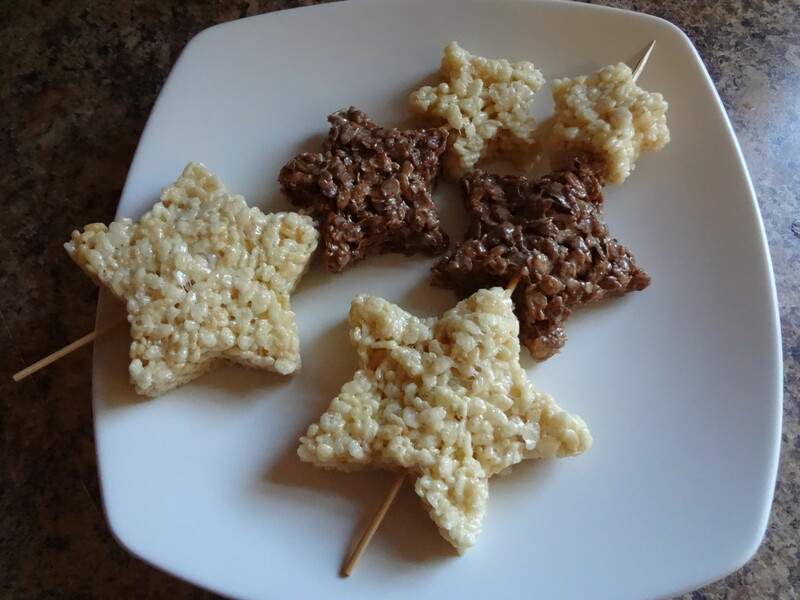 Great alternative to sugary treats and oh so simple to do. 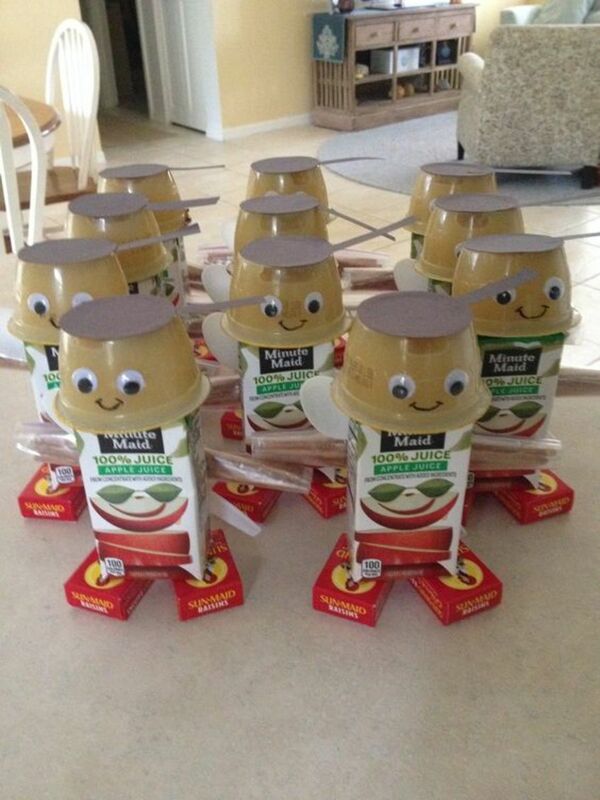 Brilliant for a preschoolers lunch, just stack rasins and use a yoghurt as the head. 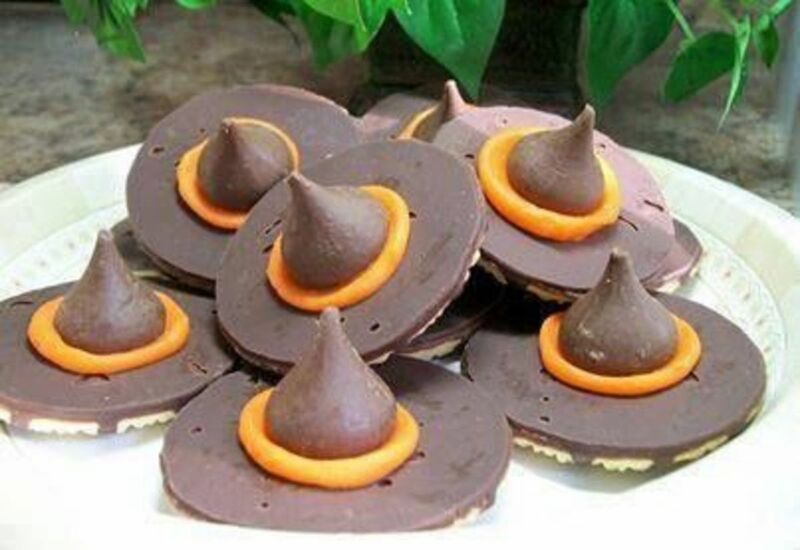 What you need: 1 package (11.5 oz) fudge-striped shortbread cookies (32 cookies) Hershey's® Kisses® brand milk chocolates, unwrapped 1 tube orange icing Attach 1 chocolate candy to chocolate bottom of each cookie, using decorating icing. 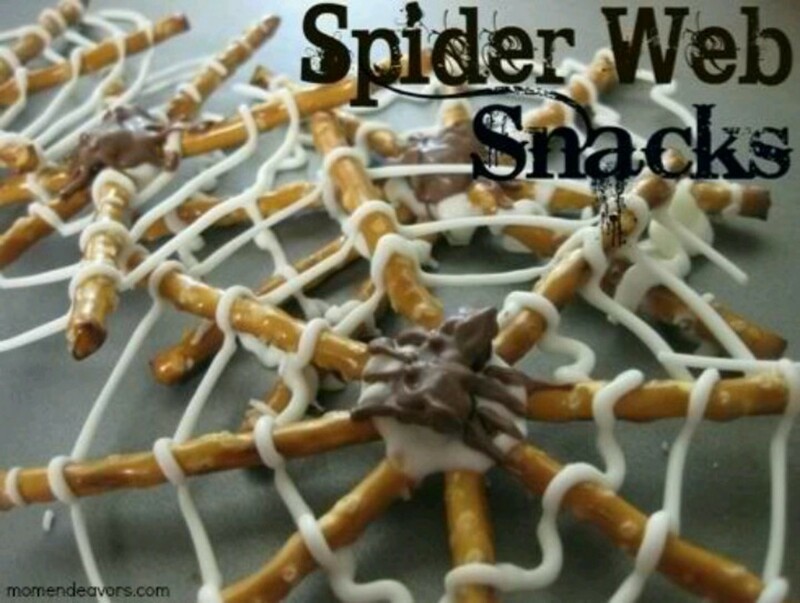 Make the a super cute treat for your little ones using pretzels and icing to make these Creepy Spider Web Snacks. Aren't the orange and black just perfect together? Not only are they a great addition to your party they are healthy and look like jewels! These can be customized for a whole range of things from baby showers to birthday parties, its all in the color of the sprinkles you choose! 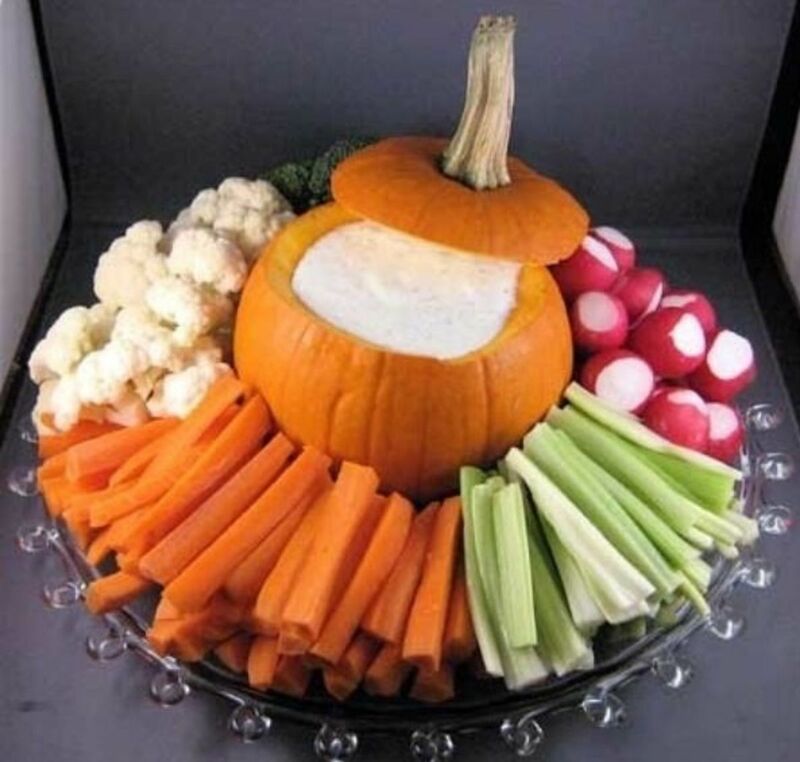 Fill a pumpkin with a nice cheese dip and cut up celery and carrots for dipping. 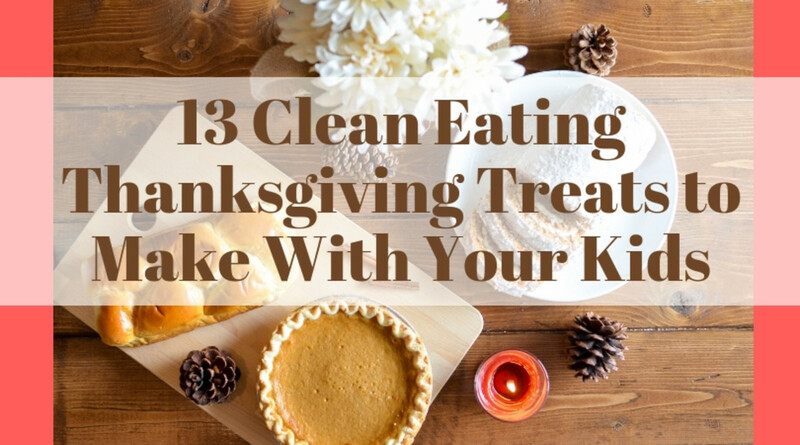 This festive idea also works great for Thanksgiving. Click on the link for more tips. Buy some surgical gloves and fill with treats like Smarties, mini Hershey candy bars and mini Reeses peanut butter cups, and Hershey Kisses. 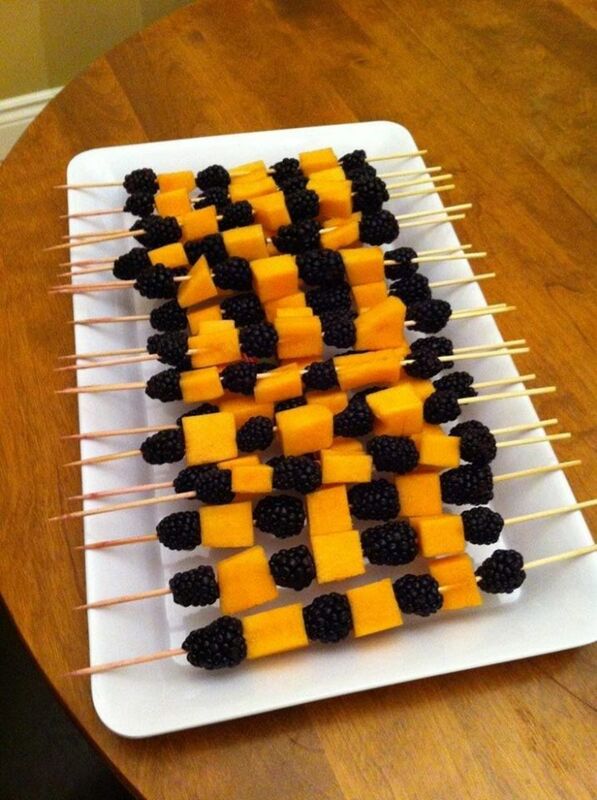 Finish by tying them with ribbon. This is perfect for adding the sparkle to your party. Melt jolly ranchers in oven 250 for 5 min and pour over apples. 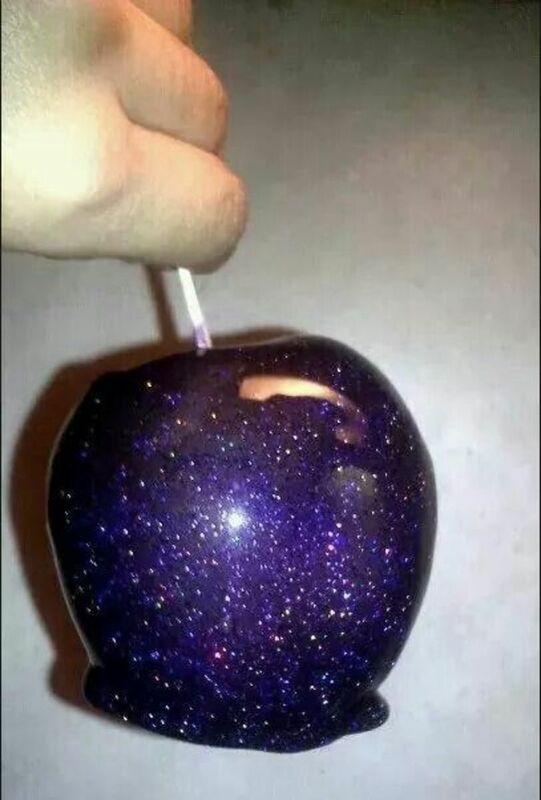 Add edible glitter for sparkly effect. and a Tube of black decorator's icing to make these inspired cakes. Scary ribs are brilliant for Halloween dinners. 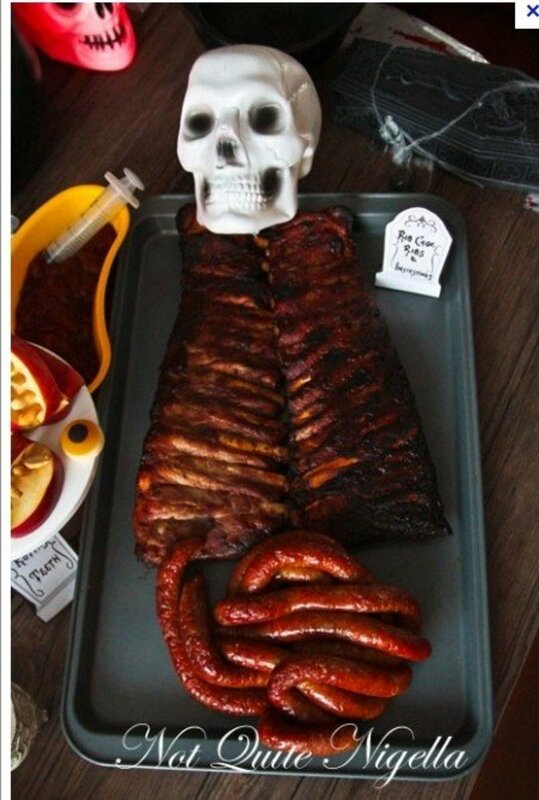 Get a rack of ribs and then deli style sausage in links and place a skeleton head on top. 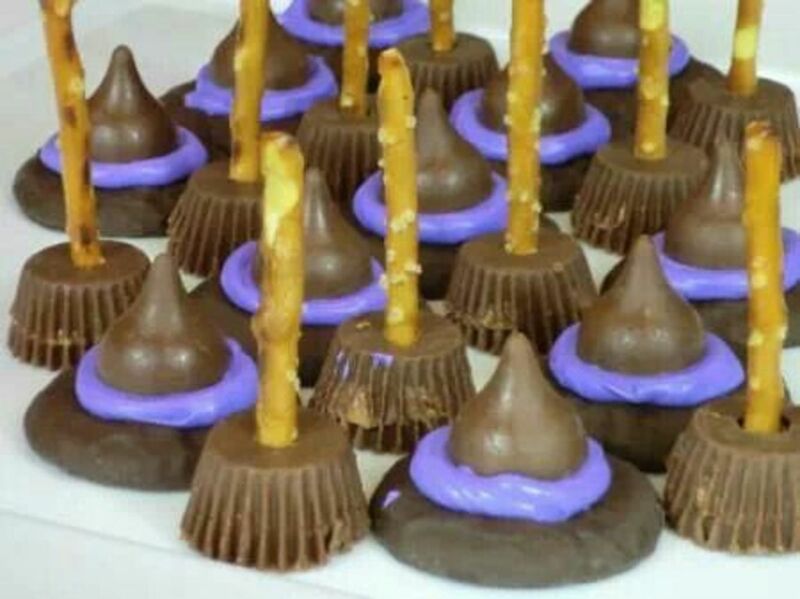 Reeses mini peanut butter cups with a pretzel stuck in it are so cute as edible brooms! 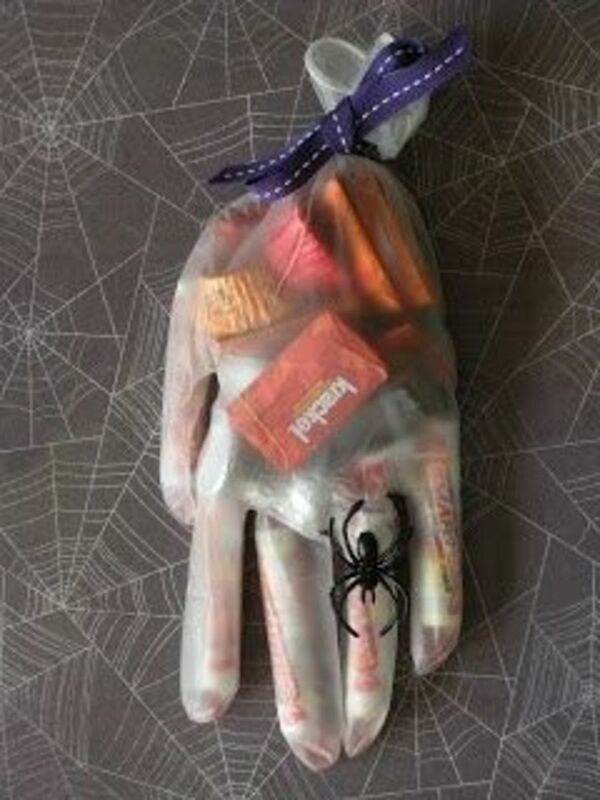 If you love these creepy ideas remember to share!! 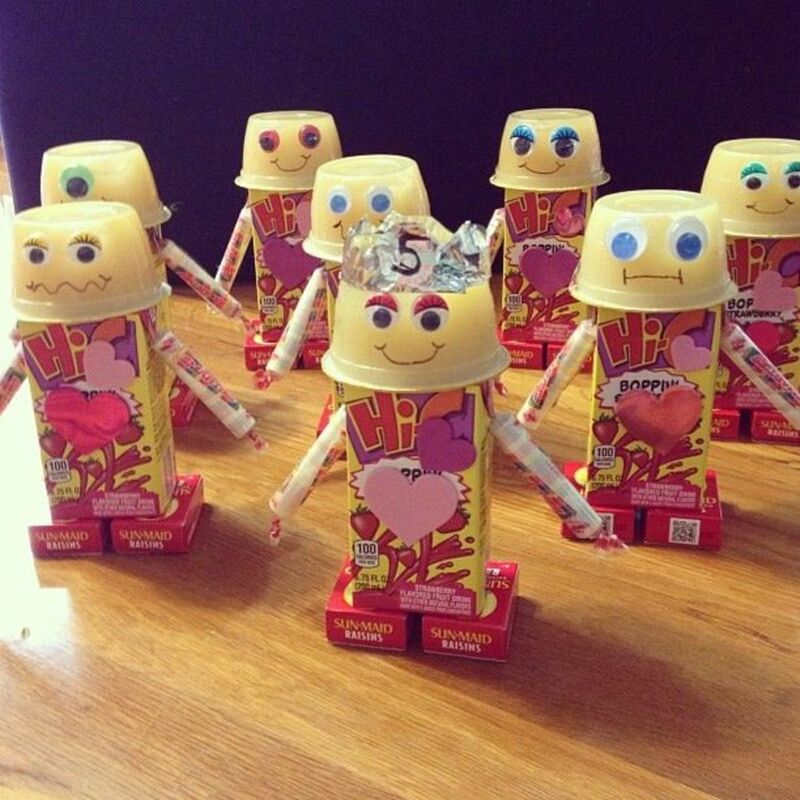 So easy and cute to make. Even for the healthy eaters in us all. 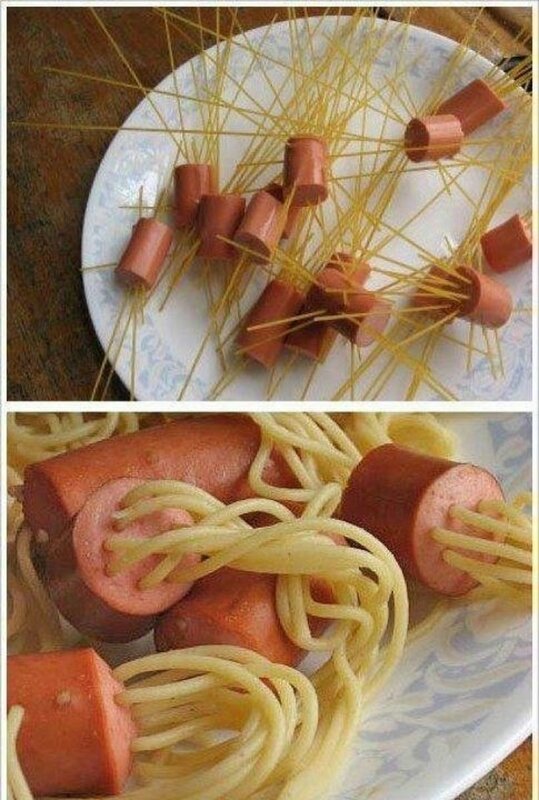 Simply pop some uncooked spaghetti in some chopped up hot dogs and boil . 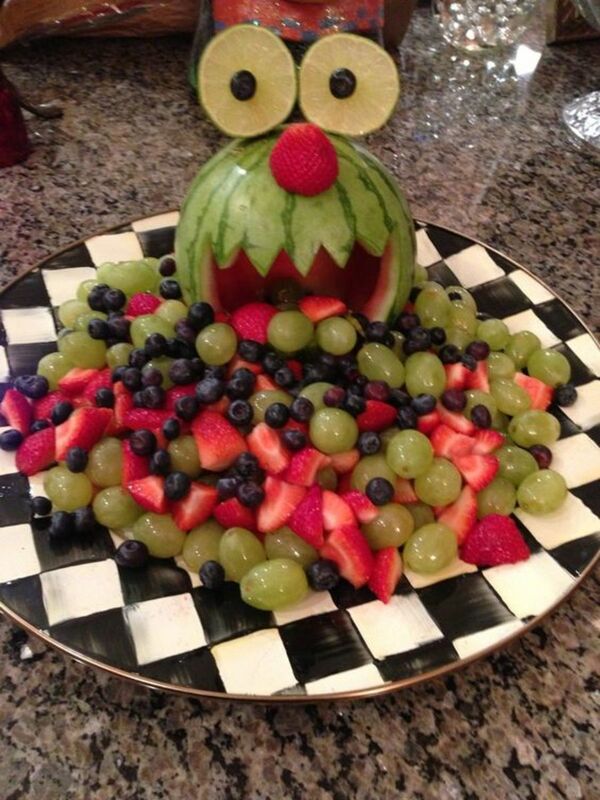 Kids will love the look of this creepy food on their plate. 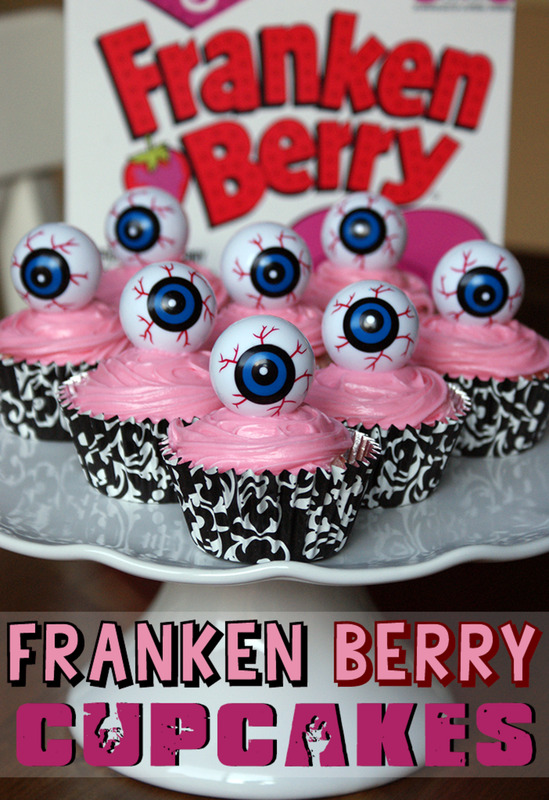 These are super cute and great for kids parties or even to take to school. 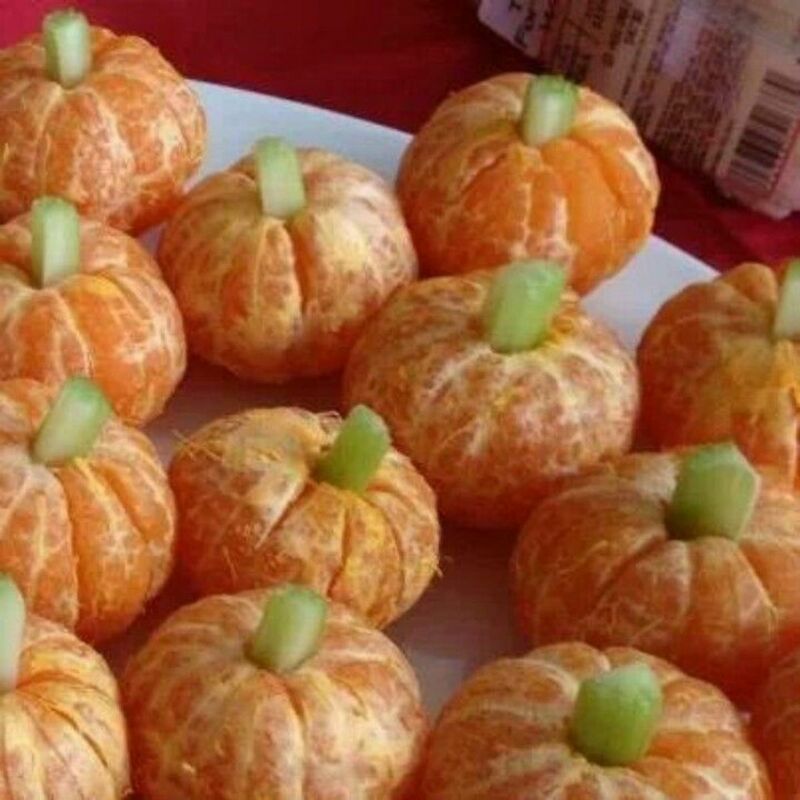 Easy to make and kids will love these! You just need a juice box and fruit cup. 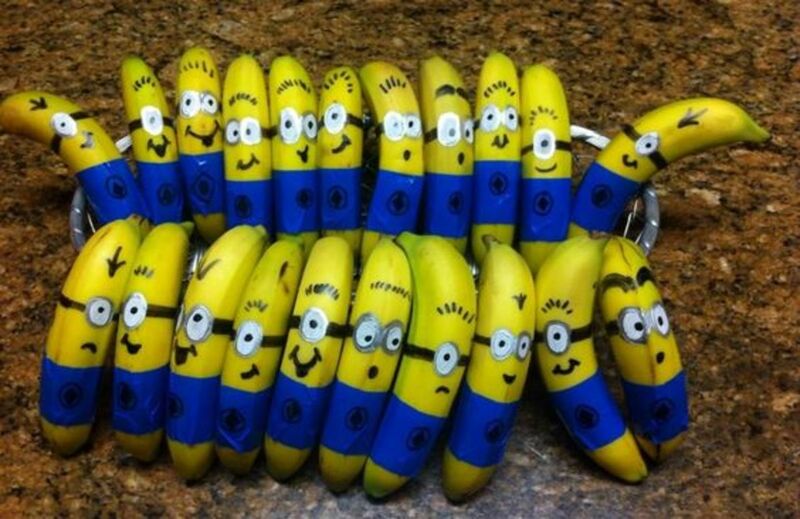 Bananas get a cute makeover with this minion look. A Water melon looks so tasty with grapes ! 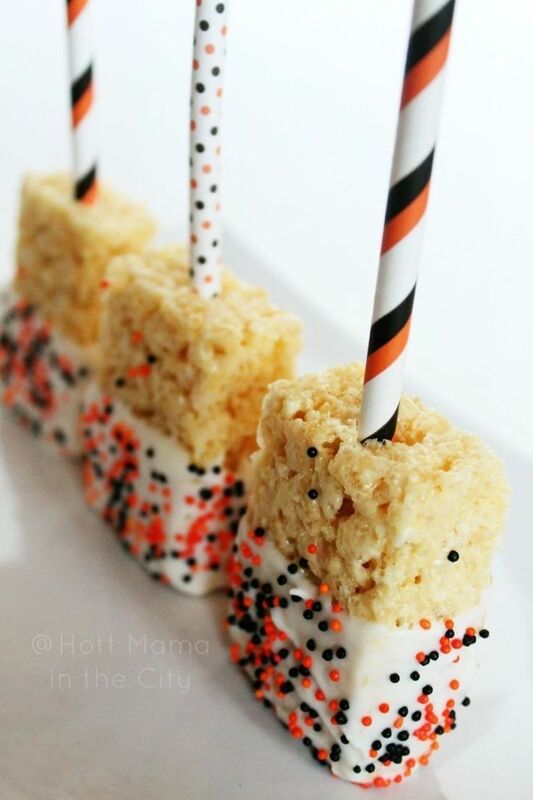 These are cute Halloween treats! I will definitely try some of these! Thanks so much Deborah Diane ! Totally agree , think I like the cheese broomsticks , something savory ! 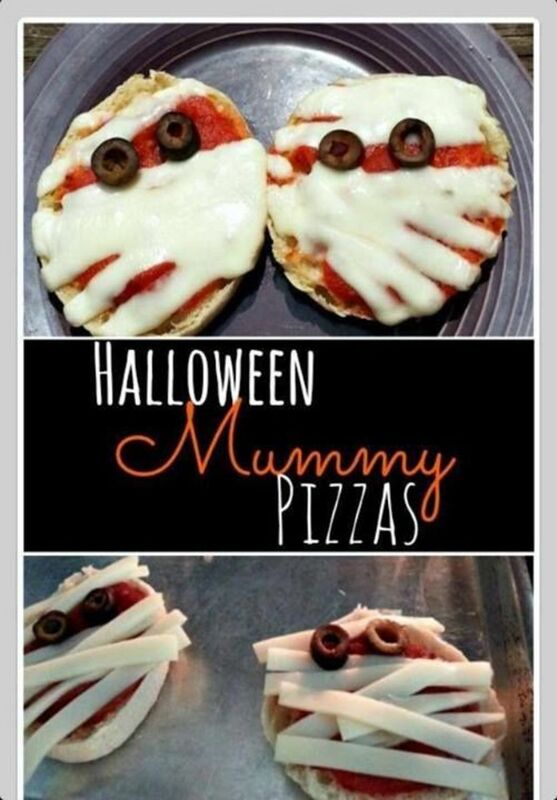 Very cute ideas for Halloween. I don't know what I like best?! ?